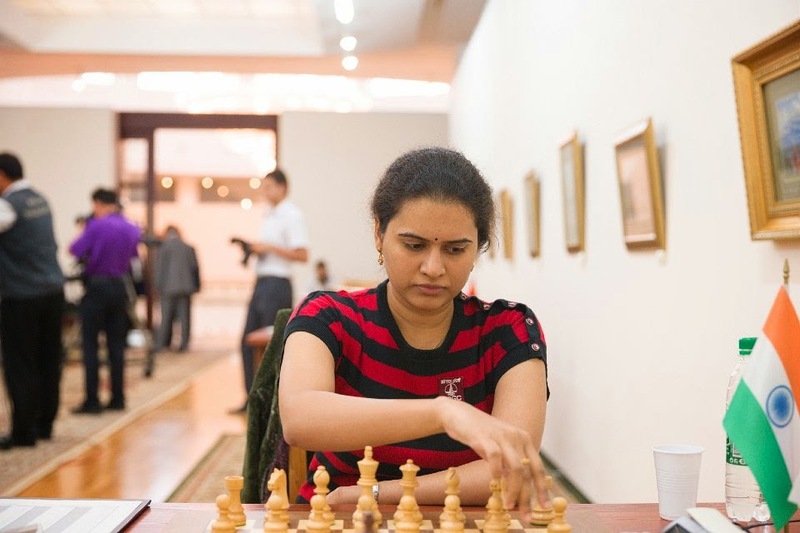 Indian women's chess stars Koneru Humpy and Harika Dronavalli are leading the table at the Tashkent Women's Chess Grand Prix after three rounds. While top seed Humpy is in first place with three wins for a perfect score, Harika is right behind in second place with 2.5 points. The Tashkent Women's Grand Prix is currently being held in Uzbekistan from September 17th - October 1st. The tournament is part of the Women's World Championship cycle 2013-14 that will determine the next challenger for the world title. The 12-player round robin is based on the time control of 90 minutes for the first 40 moves, with 30 minutes being added at that point and an additional 30 seconds per move through the entire game. Koneru Humpy, a former World Championship Challenger, beat Ju Wenjun, Elina Danielian and Alexandra Kosteniuk in the first three rounds for a perfect score. Harika, on her part, Bela Khotenashvili, drew with Guliskhan Nakhbayeva and beat Olga Girya. You can watch the games live at the official website every day including boards with analysis and live video feed. 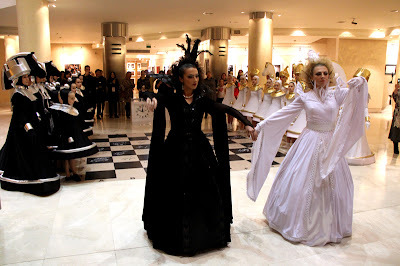 The opening ceremony of the third leg of FIDE Women Grand Prix Series 2013-2014 took place at the beautiful Gallery of Fine Art on the 17th of September. 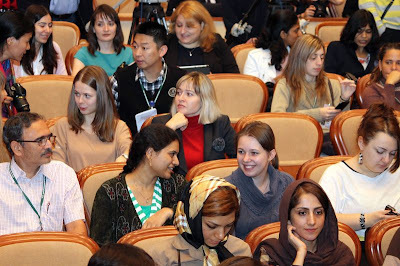 The event was attended by special guests including FIDE President Kirsan Ilyumzhinov, the Minister of Culture and Sports of Uzbekistan Minhozhiddin Hozhimatov, the First Deputy Minister of Sports of Uzbekistan Zhasur Akramov, the Head of the Administration of Sports Rashid Talipov, the Head of the Administration of Olympic reserve Kamil Bayazitov, the Head of The State Committee for Communication, Informatization and Telecommunication Technologies of the Republic of Uzbekistan Hurshid Mirzahidov and others. The Chairperson of Fund Forum's Board of Trustees Gulnara Karimova couldn't be present at the ceremony but passed her warmest welcome for the participants and expressed the hope to the future of the Fund Forum's cooperation with the World Chess Federation. GM Viktorija Cmilyte was replaced for the current Grand Prix with WGM Guliskhan Nakhbayeba of Kazakhstan. 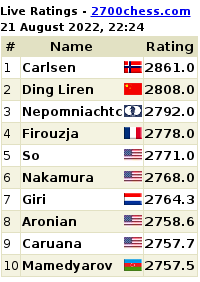 Two stages of the Women's Chess Grand Prix 2013-2014 Series, out of six, have been played so far. 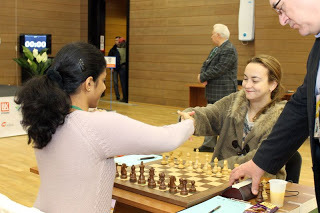 GM Anna Muzichuk is currently leading the Chess Grand Prix score with 250 points, GM Nana Dzagnidze is in second place with 220, and third is GM Tatiana Kosintseva, who has replaced her sister Nadezhda for the entire Grand Prix Series, with 190. 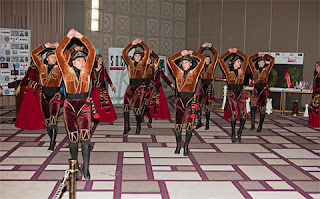 All could change after the Tashkent Chess Grand Prix! 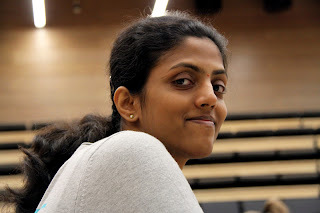 KHANTY MANSIYSK (Russia): Top rated Grandmaster Koneru Humpy has begun her campaign for the World Chess title with a win with Black over Denise Frick of South Africa in the first round on Sunday. 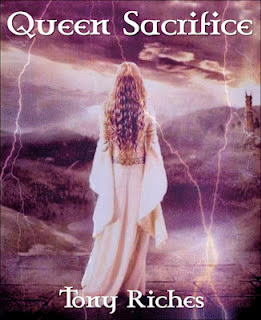 Frick went for a crazy all-out attack on the Kingside down the h-file, but Humpy knew to handle it all with a forced Queen exchange and was never really in any serious trouble. 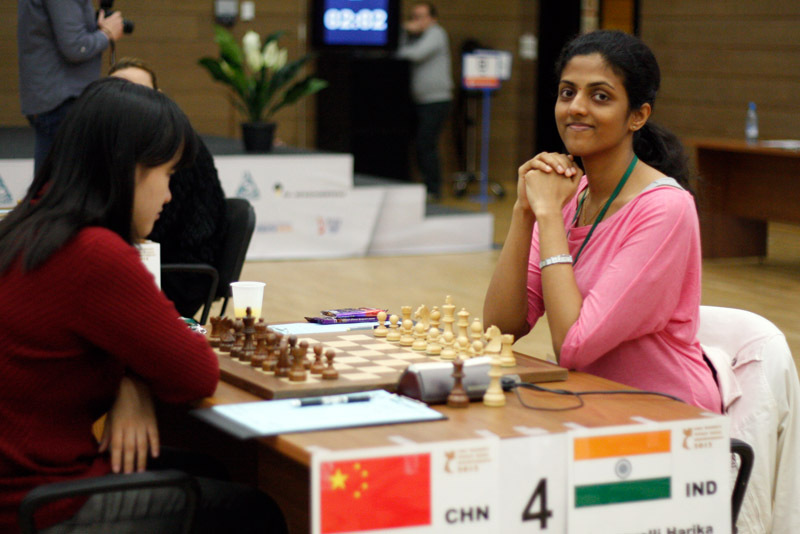 The all-India match between Soumya Swaminathan and D Harika ended in a draw. While there were no great surprises in the first game of the first round, the second game to be played on Monday is likely to bring many of the higher ranked under pressure as they drew. The list includes Harika who either has to win or force herself in to the tiebreaker the following day. The championship is back to the knock out format wherein 64 top woman players across the globe take part fighting for a total prize pool of $450000. Humpy and Harika were ousted in the semis in the previous edition of the event. In the return game now, Humpy just needs a draw to advance to the next round. Reigning women's world chess champion, Hou Yifan of China, draws a white pawn at the colourful opening ceremony that took place in Khanty-Mansiysk earlier today. 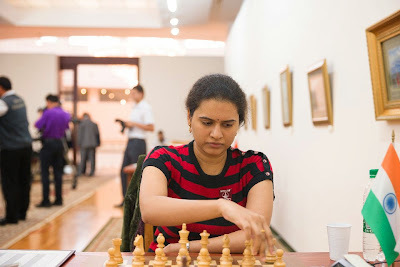 RUSSIA: Grandmaster Koneru Humpy will take on Denise Frick of South Africa in the first round of the World Women's chess championship on Sunday. Looking for an elusive world title, Humpy starts as the highest rated player in the 64-player knockout event that will have almost all the top rated woman players of the world. Russian chess player Valentina Gunina has won the Women's World Blitz Chess Championship in Batumi, Georgia. On the second day of play, on Wednesday, she amassed a total of 13 points out of 15 rounds. Earlier, this year, Gunina had also won the European Women's Women's Blitz Chess Championship and the European Women's Championship in classical chess. Second place went to Natalia Zhukova of Ukraine and third place went to Anna Muzychuk of Slovakia. Both tied for the second place with 10.5 points. Russia's Alexandra Kosteniuk was a trifle unlucky to miss out on the medals with her fourth place at 10 points. 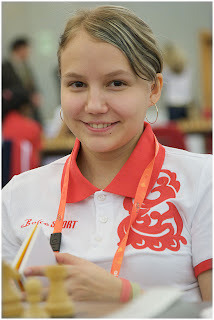 Kosteniuk had won the silver medal in the women's world rapid chess a day earlier. Bulgaria's Antoaneta Stefanova had to settle for the fifth place with 9.5 points. Stefanova had won the gold medal a day earlier in the rapid section. 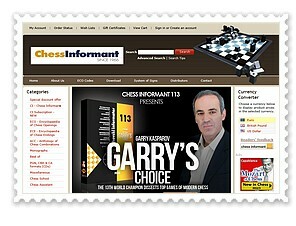 The Women's World Blitz Chess Championship 2012 begins in Batumi, Georgia within a few hours today and you can watch all the action live at the official website of the event: http://e2e4.ge/index.html. Fifty players are taking part including India's Koneru Humpy who is the second seed and Harika Dronavalli who is seeded ninth. Top seed is Anna Muzychuk of Slovakia. 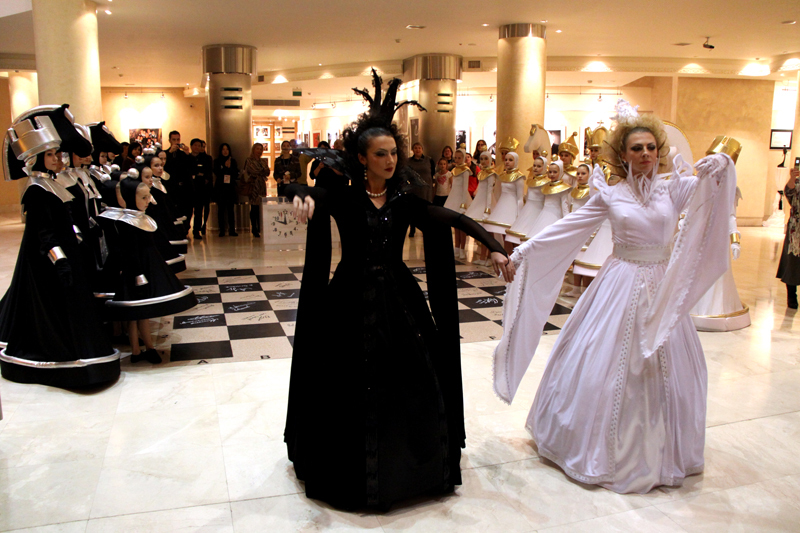 Fantastic Chess continued on the third of the Batumi Women's World Rapid Chess Championship on Saturday in Georgia. Overnight joint leaders Antoaneta Stefanova and Koneru Humpy had varying fortunes. Stefanova is now sole leader after nine rounds with 7.5 points as she drew with Koneru Humpy, beat Nino Khurtsidze and Kateryna Lahno. Humpy, on the other hand, after drawing with Stefanova, lost to Kateryna Lahno and beat Guo Qi. That dropped Humpy to joint third with Kateryna Lahno and Anna Muzychuk. In hot pursuit behind Stefanova is the very talented 12th Women's World Chess Champion Alexandra Kosteniuk. Her fiery attacks and sharp play fetched her a draw against Huang Qian, plus two superlative wins over Elisabeth Paehtz and Tan Zhongyi.